Is The Universal 5 position Weight Bench For You? The name alone of the Universal Five Position Weight Bench sums up nicely what this bench offers. It’s cheap in price but not in quality. You can purchase a stable bench with a number of adjustments made from solid materials that can get you started at home. There are a few drawbacks – but to be honest the benefits outweigh the negatives in this bench especially when it’s listed at such a great place. An ideal first weight bench purchase. As the name suggests, there are five different positions – including the elusive decline position for adjustable benches! The angles go from -10°, 0°, 15°, 30° and 45° giving you options for dozens of different exercises to work your upper body and your core. The Universal Five Position measures 51” in length, 17.5” wide and a height of 25”. It has a fixed leg brace with 8” foam rollers to keep your legs in place for a safe workout with the right technique, keeping you controlled throughout your range of motion. The maximum user weight is 250lbs, or a combined user and lift load capacity of 430lbs. At 33.4lbs it’s a fairly lightweight bench which will make it easier to lift, but without skimping on stability. The frame is steel with vinyl upholstery which you can simply wipe down after use. There’s a lot of praise for just how well the bench is made, especially given it’s at the cheaper end of the price scale. There are stabilizer levelers at the bottom to ensure there’s no rocking or wobbling so you’ll find it’s perfect for almost all flooring surfaces. There are also wheels at the back for ease of movement – except no handle. The padding seems to be the perfect thickness and comfort too – not too hard, not too squishy, allowing you to focus on your technique. Two years for the frame, and 30 days for the padding. It’s about standard time for most benches. You will need to put this weight bench together yourself, but it comes with a couple of wrenches to help you out. However they’re not the best quality and you might be able to find something in your own toolbox which would work just as well if not better. There’s a parts diagram included to help you with the assembly, although they aren’t clear-cut instructions so give yourself some time to put it together. While there are five different positions on this bench, it’s a shame there’s no upright 90° position. This can make it tricky if you’re wanting to do exercises like shoulder presses, although it’s not impossible. As I mentioned before, there are wheels, but no handle. Fortunately the bench is relatively lightweight so you won’t be left struggling, but it’s slightly annoying if anything that there’s no handle. The leg holder can feel a bit strange and some users may feel it’s in a weird position against their legs. It’s a neat feature to have as it helps keep you more stable during exercises but it’s not the most comfortable thing in the world. And the bench doesn’t fold away completely so you won’t be able to pop it under the bed if you want to hide it away. The decline position is unsupported unlike the other inclines; it rests flat against the bottom bar. If you look in the photos you’ll see all the other brackets for 0 to 45 degrees. It can be a bit confusing when trying to figure out the decline position, so just lift the arm back against the backrest and drop it down and you’ll understand how it works. This is a great bench for beginners or someone looking at purchasing their first bench. It’s no fuss, it has a variety of positions and it’s cheap. You’ll be able to lift a high amount of weight, but still being a relatively lightweight bench for ease of movement. Once you’ve figured out how to get the backrest into decline you won’t have any issues with the angles, other than you might need to make a few adjustments to your body if your exercises call for a 90° angle. Having the decline position gives you a ton of more options anyway. A solid purchase for a cheap price that will get you started for a beginner weight bench. You can find the cheapest price here on amazon. You can find a more detailed Weight Bench Review here that I did to help everyone see the major differences if you want something with more features. 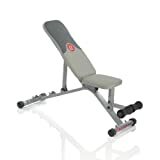 ← Bowflex Selecttech 3.1 Adjustable Bench Right For You?